On Wednesday, the US's top military commander said strategy in Afghanistan was shifting to include raids across the border into Pakistan. Pakistan has said it will not allow foreign forces on to its territory. The Pakistani ambassador to the US has disputed the claim, first reported in the New York Times. "In our bilateral discussions, no such idea has been mooted and will certainly not be accepted by Pakistan," Husain Haqqani told Reuters. "Pakistan would not accept foreign troops. This is not the best way to pursue the war against terror," he said. The US say that Pakistan's north-west tribal areas are being used as "safe havens" by militants preparing attacks on Afghanistan. But Pakistan's Chief of Army Staff, Gen Ashfaq Parvez Kayani, said there was "no question of any agreement or understanding with the coalition forces whereby they are allowed to conduct operations on our side of the border". He said the sovereignty and integrity of Pakistan would be defended at all cost. A senior Pentagon official told the BBC that Mr Bush gave his approval this summer for cross-border raids into Pakistan. The order includes the use of conventional ground troops crossing the border into Pakistan to pursue militants there. 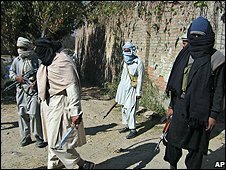 An unnamed former intelligence official told the New York Times that the Pakistani government was not told about intended targets because of concerns that its intelligence services has been infiltrated by al-Qaeda supporters. The BBC's Kim Ghattas, in Washington, says it is a sign of growing US frustration with Islamabad's lack of assertive action against the militants. There is also an increasing concern about the threat such militants pose to Nato troops in neighbouring Afghanistan, and potentially to the US, says our correspondent. The US has been carrying out regular military air strikes on Pakistan from Afghanistan, but ten days ago US troops carried out a ground assault for the first time. Pakistan said the raid in South Waziristan was a violation of its sovereignty and summoned the US ambassador to hear a "very strong protest". Islamabad fears that attacks by US troops could encourage support for the Taleban militants among tribal groups in the border area. The latest revelation appears to be part of a slow change in US strategy towards Pakistan and will only add to the tensions between the two countries, our correspondent adds. Officially, the US has stressed the need for co-operation with Islamabad. 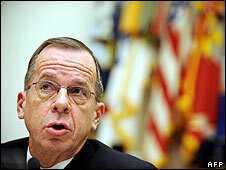 On Thursday, the chairman of the US Joint Chiefs of Staff, Admiral Mike Mullen, told Congress that the US must continue to work closely with Pakistan. "In my view, these two nations are inextricably linked in a common insurgency that crosses the border between them," he said. "We can hunt down and kill extremists as they cross over the border from Pakistan... but until we work more closely with the Pakistani government to eliminate the safe havens from which they operate, the enemy will only keep coming." The US move to focus efforts on the Afghan-Pakistan border was welcomed by Afghan President Hamid Karzai. "Change of strategy is essential," Mr Karzai said at a news conference in Kabul on Thursday. "It means that we go to those areas which are the training bases and havens - we jointly go there and remove and destroy them."